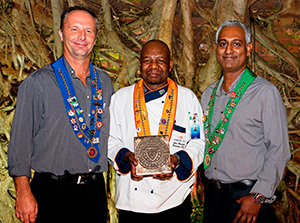 The Durban International Convention Centre’s Executive Chef, John Moatshe, was awarded the prestigious Chaîne des Rôtisseurs Brass Plaque/Blazon for his achievements in the culinary field. The accolade is presented to a chef who maintains a superb level of cuisine, hospitality and service, as required by the exacting standards of the association. The Chaîne des Rôtisseurs is an international gastronomic society founded in Paris in 1248 and has more than 25,000 members in over 70 countries around the world. The association promotes the art of fine cuisine and supports the development of young culinary professionals.